Summary: A few more dry days before the rain chances come back this weekend. We are all taking a much deserved break from the rain. Heck, yesterday we even seen some sun which was pretty nice. Today we will continue the dry spell. It will be mostly sunny today with a high of 84 degrees. Tonight, expect our low to drop to about 64 degrees under mostly clear skies. Tomorrow will be a repeat of today, only slightly warmer. Friday’s high will reach about 87 degrees under mostly sunny skies. Rain chances return Friday night at 30% chance of rain and storms with an overnight low of 66 degrees. NAM4 is showing a little bit of rain off to our west early Saturday morning that comes from the north and heads straight south. This is Saturday at 1am. This may or may not bother us overnight, so nothing to be too concerned about right now. The weekend rain chances come back. 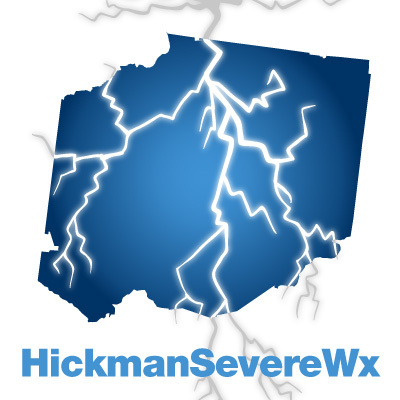 Unfortunately, Saturday looks to have a 30% chance of rain and thunderstorms with a high temperature of about 85 degrees. Saturday’s overnight low will drop to about 66 degrees while our rain chances will drop slightly to 20%. 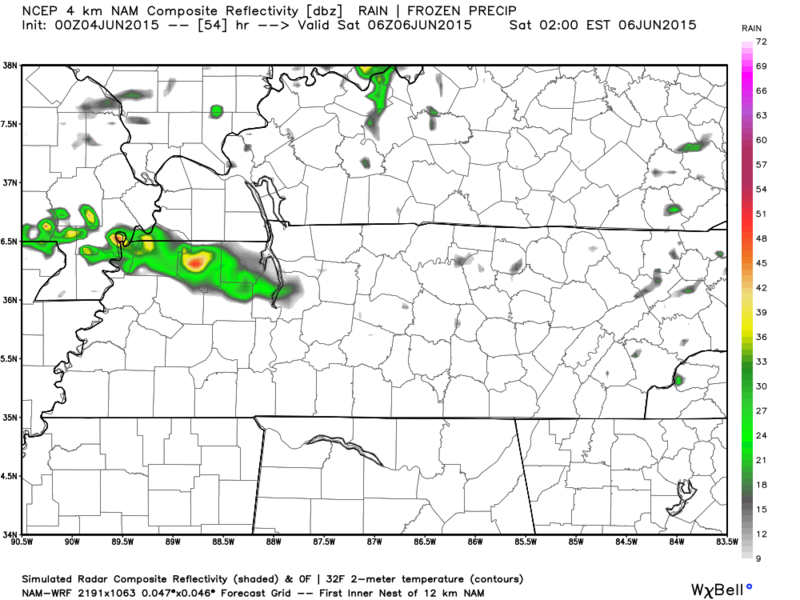 The GFS model is showing some precipitation around 7am Saturday morning. Rain seems to hang around into Saturday night as well. 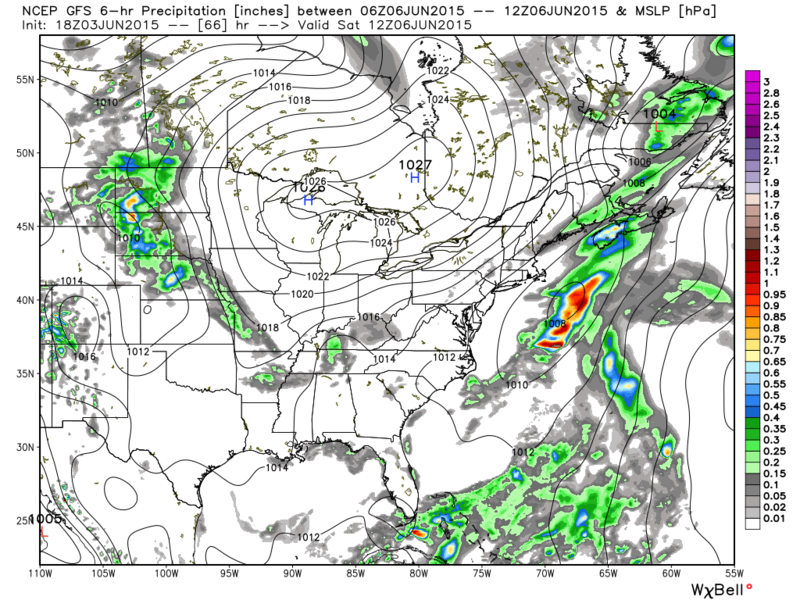 Here’s the GFS look at 7pm Saturday night. Sunday, we are looking at a smaller chance of rain at 20% with a high temperature of about 86 degrees. Sunday night, rain chances remain at 20% with an overnight low of 60 degrees. 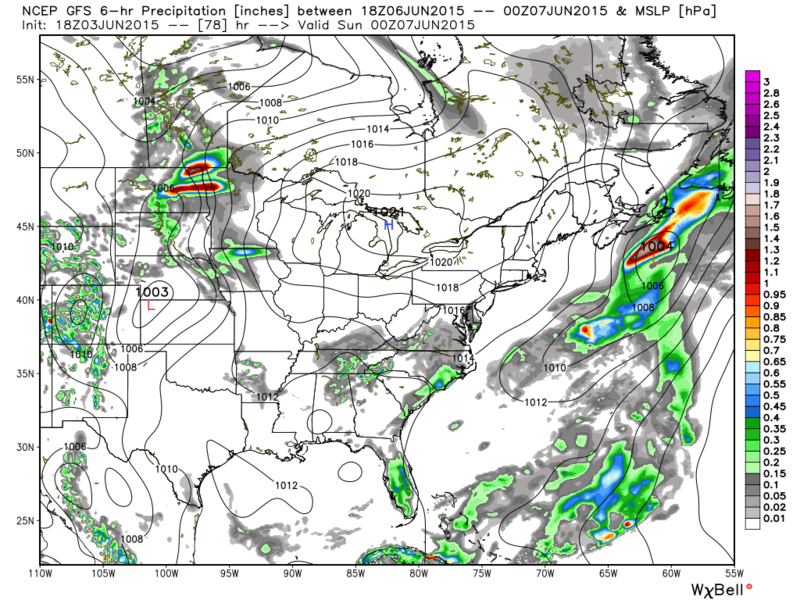 The GFS model actually shows Middle TN pretty dry for Sunday. A 20% chance of rain isn’t much, unless you are the lucky one who gets rained on.